This powerful Power Analyzer was designed to help R&D to create a new generation of environmentally friendly products and technologies. It has been developed and produced in our ISO14001 approved facilities, in accordance with YOKOGAWA's "Guidelines for Designing Products for the Environment", and our "Criteria for Environmental Assessment in Product Design". We have adopted these Guidelines and Standards to help protect the Global Environment, consistent with the focus of the Third Conference of the Parties to the United Nations Framework Convention on Climate Change (COP3, Kyoto, December 1997). 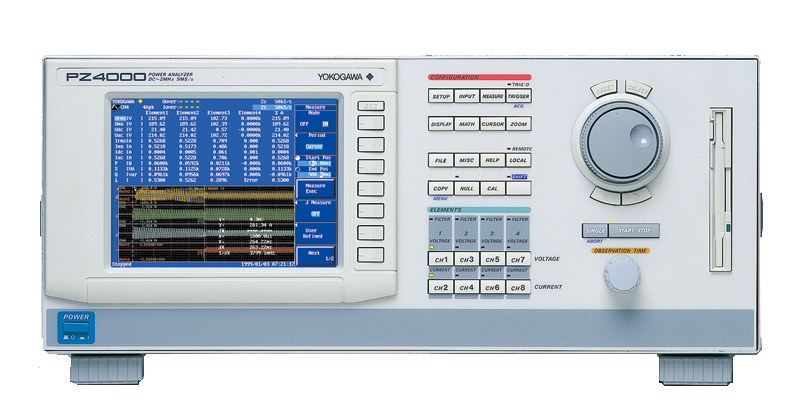 Wide measurement bandwidth (DC, up to 2 MHz). Accurate capturing of input waveforms using high-speed (maximum 5 MS/s) sampling. Voltage and current waveform display and analysis functions to enable power calculations on fluctuating inputs. Harmonic analysis (up to 500th order) and Fast Fourier Transform (FFT) functions to enable high-frequency power spectrum analysis. Multiple channel, synchronized measurements using multiple units and Master-Slave trigger function simplifies complex investigations. Environmentally friendly design based on YOKOGAWA's Guidelines for Designing Products for the Environment and Criteria for Environmental Assessment in Product Design. Sensor input module option enables evaluation of motor efficiency and total efficiency including the motor drive. Correlate between displayed waveforms and calculated power values. Waveform displays and calculated values (e.g., power values) are based on sampled data stored in internal memory, so they are correlated with each other. Measured waveforms and calculated values can be checked at the same time to prevent erroneous measurements. No probe needed for waveform measurements. Voltage and current waveforms can be measured without using oscilloscope differential probes and current probes. The PZ4000 can make waveform measurements much more accurately than with conventional oscilloscopes. Measurements can be made over a wide frequency range (DC up to 2 MHz), making it possible to measure power loss on electronic components, high-frequency lighting equipment, and other devices. With the PZ4000, you can measure the lamp current of fluorescent bulbs using a Delta Computation function. The function computes the difference of the instantaneous values between the output current of electric ballast and a cathode current. With the PZ4000, you can measure power loss resulting from actual load applications, instead of evaluating characteristics based on small signals using an LCR meter or an impedance analyzer. Take full advantage of the 4 M word internal memory (optional; enough for 4 million samples) to obtain precise measurements of extremely low-frequency (several mHz) signals. Internal memory (maximum 4 M words) stores your measurements. You can calculate and display voltage, current, and power values for specific portions of the total memory (equivalent to 100 k words of data). The display makes it easy to see how the load fluctuates with time. In the past, it was necessary to measure inrush current and power values at power-on using measuring instruments such as oscilloscopes. The PZ4000 performs these measurements much more accurately and greatly simplifies this procedure. Power measurements on equipment with fluctuating loads are normally obtained by measuring the energy in certain operating patterns over a long time period using an integration function. The average power value is then calculated. In contrast, The PZ4000 lets you make power measurements over a specific period defined by adjustable cursors. This reduces the time required for measurements. The PZ4000 lets you analyze harmonics (up to 500th order) using high-speed sampling. With the FFT calculation function, you can perform spectrum analysis in the high-frequency range (up to 2.5 MHz). Analysis results are displayed on spectrum graphs. In addition, vectors showing the fundamental components of distorted waveforms can be displayed to give a visual presentation of the load balance in a 3-phase power supply system. With the PZ4000, you don't need a frequency analyzer to perform spectrum analysis on the carrier component of an inverter. Up to now, this type of analysis has been difficult. A major advantage with the PZ4000 is that you can input signals directly without using probes. This removes any error due to probe tolerance. The vector display using the harmonic analysis function lets you visually know the condition of each phase in a 3-phase circuit equipment. This makes evaluation simpler than when calculations are performed manually based on numerical data. Please refer to the attached Excel spreadsheet for complete information regarding the RS232 cable pinouts used with by the WT & PZ Series Power Analyzers.